This astrolabe by Georg Hartmann of Nuremberg was in England by the 17th century when it came into the possession of Archbishop Laud, whose coat-of-arms now appears on the back. The rete, pin and wedge are missing. 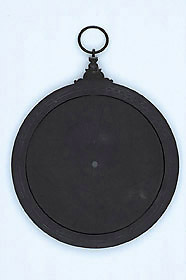 The instrument is completely black on the outside, due probably to atmospheric conditions, such as a gas-lit room in the nineteenth century; the inner part of the plates has, in fact, not been affected.